Pickled or preserved lemons give this dish an unmistakably Moroccan flavour. The secret to using them successfully is to drain and rinse them thoroughly and to use only the peel, as the flesh can be unpleasantly salty. Place the couscous in a large bowl. Pour the stock and 200ml cold water into a saucepan. Bring to the boil then pour the liquid over the couscous, stir and cover immediately with clingfilm or a tight-fitting lid. Leave to absorb for 10 minutes. Meanwhile, quarter the lemons and remove the flesh with a sharp knife and discard. Rinse the peel then cut into thin shreds. Roughly chop the herbs. 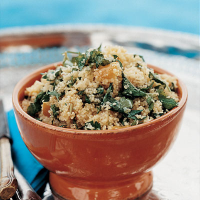 Stir the couscous with a fork to break up any lumps. Add the prepared lemon peel and herbs. Season generously and drizzle with the oil. Mix thoroughly, then spoon into a serving dish. The couscous can be easily carried in a covered container or in its serving dish. Stir with a fork to 'fluff up' before serving. This dish can be served warm if preferred. Microwave on full power, stirring occasionally, for 3-4 minutes until heated through, or cover with buttered foil and heat in a preheated oven at 180°C, gas mark 4, until the couscous is hot.